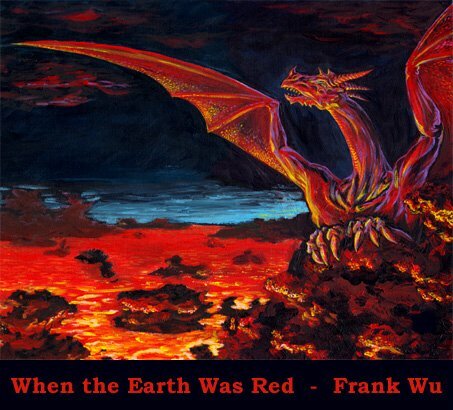 The full title of this painting is "A long time ago when the Earth was red." A portfolio piece, it is for sale if you want it. Please contact me for details. The scene is a newborn planet Earth, 4.6 billion years ago, the surface still hot, smoldering, full of lava and burning flames. What place could be more ideal for dragons? Of course, there's no oxygen in the air, so perhaps they breathe methane or metabolise sulfides. And there hasn't been enough time for them to appear naturally, so where are they from? Another planet? The future? Perhaps an even more distant past. It's a mystery. This is their king, so what is their civilization like? What kind of religion do they have? What moral dilemmas face them? What kind of music do they play? Thus the saga begins... More paintings from this world are to come... The next is here.